Paytm brings flat Rs 20 Cashback on Jio Recharge. Minimum transaction amount must be Rs 148 or above. Applicable only for New JIO users. I used this promo code for Paytm Airtel recharge and received the promised cashback. Thanks! We're glad we could help you save. Thanks for choosing GrabOn. Subscribe to avail the latest Paytm deals and coupons. Coupon/Offer Details: Verified on 20 Apr 2019. Telenor is Offering Rs 100 Extra Talk time. 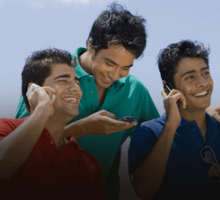 Recharge for Rs 350 and get Rs 450 Talktime. Telenor has More Spectrum Capacity Conversions. Get More Benefits Only on Telenor Recharge, No coupon code is required to get this offer. Recharge it Now to grab more savings. Hurry Up! Verified on 20 Apr 2019. Airtel is Offering Data Sharing Facility for Prepaid Users.This service allows prepaid users to create a family upto 5 members including himself/herself and share his/her 3G or 4G data pack with them. This is free of cost to it’s subscribers,there are no charges for creating a family.All members of the family must be airtel’s prepaid customers from the same telecom circle. Please Use this https://www.airtel.in/personal/mobile/prepaid/family and start sharing data to your family and friends. Coupon code is not required to avail this offer. Quick recharge is providing best deals and tarrif plans for airtel recharge from the landing page. Verified on 20 Apr 2019.Vodafone Users Can Avail this Best Pack of U Recharges. This is Valid on Vodafone U Recharge Packs. This can be Used Only 1 time Per Month. This is Valid on Web and App. This is Valid for 1st 2000 Users Every day. There are two Packs.. 1) U Medium Pack is to Recharge for just Rs 179 & Call 1 local Vodafone buddies @20p/min; Talktime Rs 20. 2) U Large Pack is Now for Just Rs 299 and Call 1 local Vodafone buddies @20p/min; Talktime Rs 20. 3) U Fun Pack is Now Rs 105 and Call 1 local Vodafone buddies @20p/min; Talktime Rs 20. Recharge now. Hurry Up! Coupon/Offer Details: Verified on 20 Apr 2019. Airtel is Offering 50% Cashback On First Transaction Made Using Airtel Payments Bank. No code is Required. Maximum cashback that can be availed is Rs 75.This is applicable only when the transaction is done through first transaction through Airtel Payments Bank . Customer can avail flat 50% cashback on recharges, bill payments, utility payments and online merchant payments using Airtel Payments Bank. Cashback will be credited to Airtel Payments Bank wallet or savings account within 3 working days of the transaction. Users avail flat 50% cashback on recharges, bill payments, utility payments and online merchant payments using Airtel Payments Bank.This is applicable only for new users of Airtel Payments Bank. This can be availed on eligible transactions (on any of the following Myairtel app, Airtel website or USSD) by a user during the offer period. Maximum Money can be added using Debit Card per day is Rs 25,000. This is not applicable for business-to-business (transactions between retailers and their agents) users. Just Airtel Recharge Now. Coupon/Offer Details: Verified on 20 Apr 2019. Airtel Money is Offering STD Calls at 25paisa. No code is Required. Users can avail STD calls @ 25 paisa for 30 days by doing a recharge of Rs 7 using Airtel Payments Bank. This is applicable only when the transaction is done through Airtel Payments Bank (wallet or savings account) on Myairtel app, Airtel website or USSD. Airtel Users can avail STD calls @ 25paisa for 30 days by doing a recharge of Rs 7 using Airtel Payments Bank.This is pertinent for client's own particular number energizes as it were . This is material Only for Prepaid clients as it were. Simply Pay With Airtel Money Now From Airtel Payments Bank. Do Airtel Recharge now. Verified on 20 Apr 2019. Airtel Recharge is Offering Recharge Prepaid Mobile Offers best Price on Recharges and also get 5% cashback on Airtel Payments Bank. Get Up to Rs 25 as cashback by Using the Airtel Payment Bank. This is Valid for 4 Transactions Per Month. Select any pack in the Guaranteed Best Prepaid Offers Section and Enjoy the Discount. This is valid for limited period. Do Airtel Recharge Now. Coupon/Offer Details: Airtel Recharge is Offering STD Calls at 25 paisa. No code is Required. Users can avail STD calls @ 25 paisa for 30 days by doing a recharge of Rs 7 using Airtel Payments Bank. This is applicable only when the transaction is done through Airtel Payments Bank (wallet or savings account) on Myairtel app, Airtel website or USSD.Airtel Users can avail STD calls @ 25 paisa for 30 days by doing a recharge of Rs 7 using Airtel Payments Bank. This is applicable for user's own number recharges only. This is applicable for Prepaid users only. Use these offers earlier in the month for maximum benefits. Recharge Now! Coupon/Offer Details: Any JetPrivilege member buying a Matrix connection will get 250 Bonus JPMiles and 8 JPMiles on every 100 rupees spent with Matrix. Also JetPrivilege member buying a Matrix Bundled Plan will get 400 Bonus JPMiles. Coupon/Offer Details: Pingo Offers $5 USD bonus in your account each time you refer a friend who signs up for Pingo. Do refer & Earn more. Hurry up, Offer ends soon. Get upto 10% cashback on every talk time. 5% Cashback on Successful Recharge/ Bill payment between Rs. 100 -Rs 249. Now get Jio data recharge at best price. Recharge coupon code is not required. Just click on special offer in the landing page. Great offer! Saved on my Jio recharge recently. Thank you for saving with GrabOn! Subscribe to get more Jio and recharge offers. This Mobikwik Offer code is valid for all users on all mobile prepaid operators. Now recharge your mobile with RechargeCube and get 100% cashback. Cashback is valid on Rs 398 plan. You don't have to use any additional coupon code to avail the offer. Recharge your Jio prepaid mobile with Rs.49 tariff and enjoy 1GB data for 28 days. You don't have to use any coupon code to avail the offer. The online world is expanding at a faster spree! Today, from purchasing to bill payment is all done online and this has allowed people to carry on with their fast pace of life and also not keeping things like monthly bill payments and like not lying down for long. Wondering how to get the same done without having to stop other daily lifestyle activities? Welcome to the world of mobile recharge offers! Hence, from making a post paid mobile bill or settling the bill for your DTH connection, when you do the same online you get access to what is known as mobile recharge coupons that in turn offers you mobile recharge coupons. Mobile or online recharging today has made it easier clear payments for gas connections or varied mobile services. Today, a wide selection of bill payments and recharges are made available on the mobile apps as well as websites. Since, a mobile is the handiest device; it is easier to search for exciting offers here. With the easy transactions that are made available by brands like Freecharge, you can have your life sorted. In addition to that you might also come across some of the best mobile recharge cashback offer that are attractive, having the best utility for you as well as secure, as the website follows stringent security measures to ensure that there is no forgery or internet threats what so ever. Freecharge recharge coupons today have made life easier and have taken off the hassle of settling bills by visiting the physical stores. By blending or rather adding the recharge portal into the World Wide Web was a ground breaking innovation that makes complete sense for people that are active on social media, such as Twitter or Facebook. This is because a whole range of mobile recharge offers from reputed names like Freecharge or Paytm are available right there. Want to have access to the most of the mobile recharge coupons available today and leverage the benefits? Go to GrabOn. This is where you’ll find the best mobile recharge coupons and promotional codes from multiple vendors or service providers like Paytm or Freecharge. Simply browse online and you will be taken to the website that showcases multiple results from which you have to sort out what is most applicable for you. From cash back offers, discounts on payment to complementary data card recharge there’s a whole world of benefits that you can enjoy here. Without leaving the comfort of your homes, stay connected to the world through online recharge services. GrabOn provides a hassle-free, easy recharge option for newbies who haven’t recharged their mobile online, and are looking for easy recharge. Yes, you heard that right! Recharge mobile online instantly. There are plenty of easy-to-recharge options here from various merchants like Freecharge, Paytm, Mobikwik, PhonePe, Amazon Recharge and much more. With exclusive merchants, comes exclusive offers! And you can find all of that here on GrabOn. You’ll love everything here, ranging from flexible payment options to recharging a variety of devices, be it Mobiles, DTH or Data Card. Browse through our stores and dive deep into an ocean of offers! Get 100% Cashback on recharge and bill payment from Freecharge. You can also get a flat 50% cashback on your first recharge through PhonePe. Mobikwik is offering flat Rs 100 SuperCash on mobile postpaid bill payments for all users. The offers are infinite and all you have to do is look for your best mobile recharge coupons, only on GrabOn. So, look no further and get talking and connecting with the world right now! Get your mobile recharge right now with the best data packs and never miss your favourite match or show. Be it Airtel, Jio, Vodafone,Idea or BSNL- get all of them recharged. The promos and offers are exclusively for you, so go ahead and seize the day..err..offers! Check our website for other great deals and offers as well. Never miss out on great deals and grab on with GrabOn!